Take a vacation in Myrtle Beach and you’ve entered one of the South’s great playgrounds, with white, sandy beaches, immaculately manicured golf courses and fresh-from-the-Atlantic seafood. 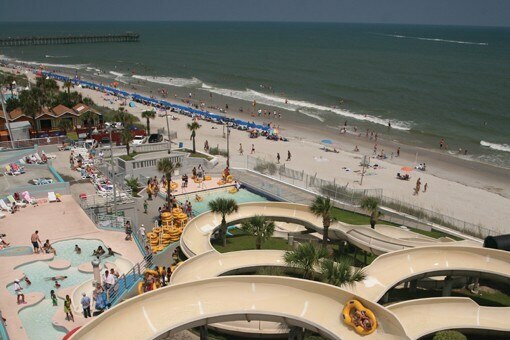 Book a Myrtle Beach hotel and get ready to play. Myrtle Beach is proudly home to a handful of vast shopping malls and centers. These malls form South Carolina’s retail hotspots, and contain a seemingly limitless array of designer stores, brand names, and independent boutiques, with a mix of cinemas, bars, and delectable seafood eateries. But if you want a break from these enormous outlets, the Myrtle Beach promenade and inland city streets host dozens of retro stores and chic independent boutiques. Sun-drenched beaches, old fashioned southern hospitality, and a roaring entertainment scene combine to make Myrtle Beach an alluring vacation spot, whether you’re a student on Spring Break out to party, a family with kids, or retirees in search of the good life. Broadway at The Beach may be the life and soul of Myrtle Beach, but its diverse communities and natural beauty mean that there’s plenty beyond the theaters and bars to explore. With rip-roaring shows, conga-shaking beach bars, and opulent casinos, a night out in Myrtle Beach is definitely one to remember. Subtlety is not its middle name, but embrace the kitsch and you’ll have the time of your life in the neon-lit, music-pumping world of Myrtle Beach after dark. With more amusement parks and play centers than you can shake a stick at, plus the miles of sandy beaches, Myrtle Beach is a haven for families with kids who need entertaining. Teens will be on adrenaline highs with outdoors adventures and go-karting, while little ones can delight in pirate adventures and magical quests. Myrtle Beach is best known as a fabulous, sun-soaked coastal hotspot. But go beyond the beaches and golf courses, and you'll discover former plantations and restored houses idea for history buffs to explore, while fans of everything from fishing to NASCAR racing will also find plenty to get stuck into.